In the last issue of ProInstaller, we shared the important and critical changes to the Carpet and Rug Institute’s CRI-104 and CRI-105 as related to the substrate. 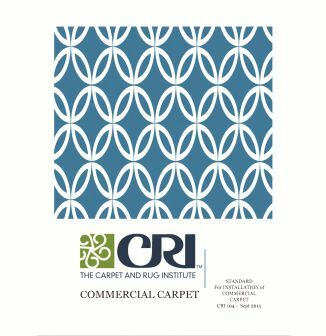 Now we’ll outline the revisions of the installation requirements in the new Commercial Carpet Standard for Installation of Commercial Carpet CRI 104 – 2015. I appreciate your remarks concerning the revisions. It’s always good to know installation professionals are keeping up-to-date on the latest information. We may not be in the majority, but we have certainly added numbers to our group in the last few years, and will continue to do so. We provide the customers with their ultimate goal: a Professional Carpet Installation! The revisions in the Commercial Carpet Standard for Installation of Commercial Carpet CRI 104 – 2015 are indicated below. Stacking heavy objects on top of carpet rolls is prohibited. Double stacking pallets of carpet tile should be avoided unless approved by the manufacturer. When bending or folding is unavoidable for delivery purposes, the carpet is REQUIRED to be unrolled and allowed to lie flat immediately upon arrival at the installation site. Consideration should be given to carpet and adhesive conditioning, material delivery considerations, material reclamations and other trades’ schedules. The edge of the hard surface flooring should not EXCEED a maximum of 1/16” higher than the total carpet thickness where no transition molding exists. For broadloom where no transition molding is used, apply a minimum of 1/8” bead of seam sealer to the edge of the carpet along the entire transition. If no expansion joint device is specified on the drawing, the building owner, owner’s representative, or other responsible party is required to be made aware that failure to address expansion joints will potentially result in installation failure, damage to the carpet and/or safety concerns. 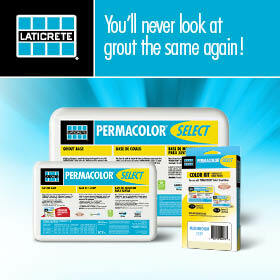 Due to the variation in size, shape, backing and installation methods (monolithic, ashlar, quarter turn, etc.) follow the carpet manufacturer’s recommendations. 11.1 To ensure straight-square installations; apply at least two perpendicular chalk lines onto the substrate (at a 90-degree angle to each other). These chalk lines should extend the entire length and width of the area to be covered. A laser line can be also utilized for this purpose. The location and intersection point of the chalk lines should be determined to achieve the design intent and reduce waste. NOTE: The intersection point mentioned above may or may not be in the center of a room to achieve the design intent. Generally, a thin film of pressure-sensitive adhesive is applied and allowed to completely dry. The design of the adhesive is to prevent lateral movement of carpet tiles and for easy removal/replacement. Due to varying carpet tile backings, adhesive recommendations will differ. Follow manufacturer’s recommendations. NOTE: In order to prevent adhesion issues or contamination, old adhesive residue must be removed and encapsulated prior to application of new adhesive. Tile in the completed installation should be tight, but not compressed. To insure proper spacing when installing carpet tile, measure the distance covered by 10 tiles installed on the floor with no visible gaps, peaks or overlaps. The measurement should be equal to 10 times the tile size +/- 1/4” unless otherwise stated in the manufacturer’s specifications. This measurement is an indication of correct placement of tiles to prevent compression or gapping between tiles. Refer to manufacturer’s recommendation for roller weight. Rolling, if required, should be performed to press the tile into the adhesive. Trimming too far into patterned carpet will compromise pattern match. Contact carpet manufacturers for specific seaming methods. All seams must be sealed unless otherwise specified by the manufacturer. Regardless of the installation method, most carpet requires an edge protective material be introduced between the edges to be joined. This material can be a liquid or thermoplastic and can be applied using various procedures and techniques. For carpet backings that require edge sealing, apply an appropriate seam adhesive covering the thickness of the primary and secondary backing without contaminating face yarns on both edges of the seam. 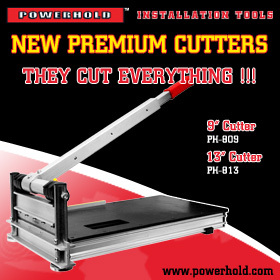 This ensures all edges trimmed for seaming are protected from edge ravel. Allow seam adhesive to dry before proceeding with the installation to prevent transfer to the face yarn. In order to weld the seam edges together, join the edges while the seam adhesive is still transferable. A seaming tape pre-coated with a thermoplastic adhesive is centered beneath the seam. Tape is heated by a seaming device which melts the adhesive, laminating the carpet backing to the tape. Seams should be made over a hard, flat surface (i.e. seaming board). A carpet seam roller is recommended to achieve proper penetration of adhesive into the carpet backing from the seaming tape. Rollers with star or spike designs are not recommended for use on hot melt seams, especially, cut or cut-loop constructions. When using a seaming iron, a grooved iron is recommended for better penetration of the adhesive. Proper iron temperature is essential to avoid secondary backing distortion. Temperature settings will vary according to iron and tape manufacturers. Always run the iron in the direction of the pile. Wood or non-heat conducting material should be used for this purpose. Premium grade tape with high tensile strength, sufficient adhesive on the woven scrim and a minimum adhesive width of 23/4” is recommended. Provide adequate ventilation to dissipate any fumes from the seaming process. Hand sewing shall be overcast stitches placed not more than 1/2” (13mm) apart and no less than 1/2” from the edge of the carpet. It is recommended that a latex coating and tape be applied over the stitching. Trowel notches wear down during use. Replace trowel as necessary to maintain proper spread rate. Working time (also referred to as slip time) is the length of time after covering the adhesive with carpet to make adjustments or manipulate the carpet without negatively impacting the permanent bond. All seams must be sealed unless otherwise specified by the manufacturer. After the required amount of adhesive has been applied to the floor and the prescribed open time has been allowed, the carpet is carefully placed into the adhesive. To insure an adequate bond, it is then required that the carpet be uniformly pressed into the adhesive using a roller designed for this purpose. Rolling should be performed with the lightest roller that will cause the adhesive ridge pattern to transfer to the back of the carpet while still leaving the adhesive bonded to the floor. Do not exceed 75 lbs. unless specifically directed by the manufacturer. In some circumstances, re-rolling is required as well as placement of weights in problematic areas. Premature traffic will cause installation failure. It is recommended that carpet installation be the last trade on any job site. However, if it is required to protect the finished floor covering from soil or paint, or if additional work is required after the installation, the carpet should be covered with a non-staining, breathable building material paper. Do not tape or staple cushion seams for double glue-down installations. Cushions should be specifically designed for double-glue application and should not exceed 3/8 of an inch in thickness. Dry lay and align all carpet breadths/widths to their proper position; and then trim seams. 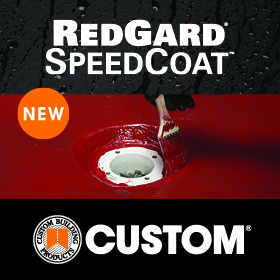 After sufficient open time, the cushion is to be installed into the adhesive in a manner that minimizes air pockets. For cushion to substrate, adhesives, application methods and spread rates are different from carpet to cushion installation methods. Refer to manufacturer’s installation instructions. Excessive trowel pressure reduces effective adhesive coverage rate. Hot-melt seaming is required for double-glue installations unless otherwise specified by the manufacturer. Do not use silicone-coated seaming tape. In the case of woven goods, carefully refer to the manufacturer’s recommendation for that specific style. Apply a bead of seam adhesive to the cut edge of one side only in sufficient quantity to seal both trimmed edges. Ensure the bead thickness is sufficient to cover the primary and secondary backing (above the cushion) without contaminating face yarns. In order to weld the seam edges together, join the edges while the seam adhesive is transferrable. Consult the carpet manufacturer for recommended installation procedures and the use of primers, if needed. Architectural strips 2″ in width (50mm) with three (3) rows of pins, or two (2) conventional strips with two (2) rows of pins each are required to provide secure attachment of the carpet and additional shear strength. Nailed or stapled tack strips are required to have a minimum of two (2) fasteners per piece. On radiant-heated floors, use manufacturer’s approved adhesive to secure tack strips. Do not use nails or screws to prevent damage to heating system. With the exception of fiber cushions, secure seams with appropriate vinyl-coated cloth cushion tape per the carpet cushion manufacturer’s recommendations. CRI 104-17.4: The direction of power stretching has changed from 8 steps to 7. ***The direction of power stretching has changed from 8 steps to 7. Size and shape of the room will determine corner designation. Red arrows denote use of a power stretcher and blue arrows denote use of a knee kicker. Step 1: Hook onto tack strip approximately 3 ft. in both directions along corner A. Based on the carpet construction, the proper head should be selected for the power stretcher (i.e. pins or cotton head). Ability to lock the stretch in place. Adjustable metal tubes ending in a padded tail block/plate. In the absence of specific instructions, tufted carpet with synthetic backing should be stretched a minimum of 1% in length and width. Patterned carpet may require additional stretch to obtain pattern match. REMOVED: Slightly less stretch to the carpet’s width compared to its length usually lessens the tendency for seam peaking. REMOVED: Minor scratching of surface finish on baseboards and moldings may be unavoidable during the tucking process. It is required that the stair tread, riser and stair nose should be clean, dry and structurally sound. If the edges are exposed, they must be edge sealed. Upholstery work needs to have no raw edges exposed. Any seams or joints must be sealed. Carpet seams need to be split in the direction of the balusters/spindles. 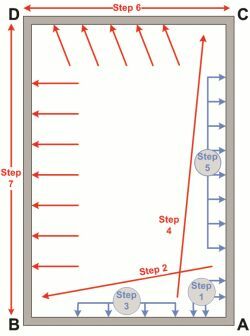 It is recommended that machine direction of the carpet be installed in the length direction of the stairs. Most carpet manufacturers recommend carpet pile direction run DOWN the stairs. “Individual manufacturers have tolerances to which their patterned products are required to conform. There are no industry standards for carpet pattern variations.” CHECK WITH THE MANUFACTURER! Factors affecting an acceptable pattern match on the job site include, but are not limited to: the method of installation, the condition and levelness of the floor and the type of carpet backing system selections. DELETED: It is imperative that all parties agree upon realistic levels of expectation before the carpet is installed. Installation of patterned carpet requires more time and expertise, often requiring the use of powerstretchers and additional staffing, thus affecting the cost of installation. (Be sure to use these words when bidding a project). It is recommended that carpet with width-wise linear patterns not be installed breadth –to-breadth along the length of a corridor to avoid inconsistent alignment of pattern. Sequencing information may be available from the carpet manufacturer. Patterned carpet requires additional material for proper pattern matching. For patterned carpet, exercise care to ensure pattern alignment along walls. The use of mechanical stretching devises, stay nails and a “dead man” may be necessary to achieve pattern match at seams and alignment along walls. Changes in manufacturing, technology and installation come at us faster than the instructions on how to install the products. The details of the CRI-104 are extremely important, but they are just the beginning. Once again, I will stress the directions of the manufacturers supersede all information. They make the product; they set the guidelines. Before you start the installation, know the requirements! It will keep you out of trouble. The more you know; the more valuable your services are! Professional flooring contractors stand by their work and always follow the manufacturer’s guidelines. Know the rules and share them with your clients; it always makes you look more professional. Include your credentials in bid documents. Your clients don’t know the difference between good installation and bad installation if you don’t tell them. A little “bragging” can bring great rewards! In the next issue, you will learn about the revisions to the CRI-105 as related to residential carpet installation. In the meantime, access the website: www.carpet-rug.org/Industry-Resources/CRI-Installation-Standards.aspx. This information is user-friendly and free from the Carpet and Rug Institute.